interesting, but not my tradition. Among the other people at Yardenit while our group was there were individuals who had come to be baptized in the waters of the Jordan River… something I could appreciate, but didn’t find particularly personally uplifting. s I complete my term as president of our congregation, I have a range of emotions. I have learned much from my experience, and I want to take this opportunity to reflect on the last two years as well as look towards the future. I have always considered challenges as opportunities. As Thomas Edison once remarked, “I never failed. I just found 20,000 ways not to make a light bulb.” As a congregation, we have faced our share of challenges during my term as president – and by dealing with those challenges head on, I believe we have established a solid foundation for our future. We have initiated a new strategic Rob Wildstein planning process. Our strategic planning committee has formed several task forces that have been hard at work developing initiatives for the future of our synagogue in areas such as membership, engagement, governance, programming Our Ahava Early Learning Center has and religious life. become a model of excellence. It has grown significantly in the past two years, While we have currently taken a pause in both in enrollment and anticipated profit. our capital campaign, a record number We were grateful to have Barry Herman of congregants have participated in return last year and agree to assist us this ambitious endeavor. I am proud on an interim basis as our Executive of the success we have achieved in the Director. How much more fortunate construction of our Ahava Early Learning we are that Barry has now committed Center, updating obsolete infrastructure to stay on in the position of Executive and remodeling areas in and around the Director for the foreseeable future and library. I am hopeful that we will develop will focus his efforts in the areas of a thoughtful process to determine how finance, development and operations. to best proceed with respect to the In addition, Lindsay Borenstein, who has capital campaign and our priorities for been crucial to our efforts in connection unallocated campaign funds. with the capital campaign, has been hired to fill the newly created position of In working through the issues facing our Associate Executive Director which will synagogue, we recognized that one of focus on engagement, membership, and our highest priorities was to solidify the communications. future lay leadership of our congregation. engagements & weddings mazal tov to the newly engaged/married couples and their loved ones! Thad Ribner & Brienna Stammer Thad Ribner and Brienna Stammer were married on March 18, 2018 in Key West, FL by Rabbi Michael Knopf of Temple Beth-El (Richmond, VA.) Thad is the son of Dr. Bruce and Barbara Ribner, and Brienna is the daughter of Bernadene Stammer and Richard Stammer (of blessed memory.) Brienna holds a BA from UVA and an MPA from Virginia Commonwealth University. She is employed as the Training and Outreach Coordinator for the Virginia Victims Fund, a state agency which serves victims of violent crime. Thad holds BS and MS degrees in mechanical engineering from Worcester Polytechnic Institute and is employed as a Senior Mechanical Engineer at HDT, in Fredericksburg, VA, which designs and makes expeditionary systems. The couple will live in Ruther Glen, VA.
Michelle Teplis is graduating from Georgia Southern University with a degree of Master of Science in Nursing with a Specialization in Adult Nurse Practitioner. Captain Jeffrey Teplis is graduating from the School of Professional and Continuing Studies at the University of Richmond where he is a candidate for the degree of Master of Human Resource Management. Michelle and Jeffrey are the children of Julie and Robert Teplis and grandchildren of Betsy Teplis and Dr. Paul Teplis. Strengthening our community from generation to generation The Strategic Planning Committee has put together task forces in the areas of Communications, Congregational Engagement, Governance, Finance, Youth/Family Engagement, and Spirituality. Each task force is commissioned to work on the framework of its specific area from February till May. Each task force area will have the month of June to consolidate and refine their proposed visionary strategies, which will be carried out by the corresponding committees at Ahavath Achim over the next five to ten years. The task force phase will come to a close after a meeting with USCJ in the beginning of July on priority settings. After this meeting, the strategic plan will be able to summarize and share all the proposed strategies generated by the task forces. The passion that has emerged from these task forces has laid the future path of success of the strategic planning process. the opening meeting The Opening Meeting, “A Trifecta for Fitness” was a smash success, thanks to Delcy Harber and Jennifer Rosenfeld for the excellent planning. We started the new year off right with learning new ways to improve our health... and we even exercised a little! (left to right) Dr. Ben Cohen, Alisa Bernath-Winters, and Lori Haber shared their expertise with our Sisterhood. We all left motivated to make the new year stronger and healthier. worship in pink The annual Worship in Pink Shabbat service was especially moving this year. We are grateful to Rina Wolfe’s commitment to honoring cancer survivors, remembering with love those that we have lost to the dreadful disease and celebrating those who put their feet first by participating in the Breast Cancer walks. Susan Sandler spoke beautifully, sharing her own story with the congregation. z'havah Under the leadership of Allison Feldman and Rachael Joseph, Z’havah had an incredible year filled with creative and fun events that brought together the young women of AA Sisterhood, creating lasting friendships. The year started with the Mah Jongg battle of the ages, Rookies vs. Veterans, and it was epic! Experienced players taught newbies and loads of fun was had by all. Z’havah planned a great program bringing together the generations over tiles, coffee and bagels…what more could anyone want? The Z’havah wine and cheese event in December was fun and delicious! The room was full of young women learning about cheese-making, tasting the many varieties of cheese, and sipping wine (even with an impending snow storm!). annual donor celebration Z’havah women enjoying delicious cheese and sipping wine at CalyRoad Creamery in Sandy Springs. In March, Z’havah designed and painted silk Challah Covers in the art room at the Ahava preschool. Thanks to artist Hellene Vermillion who taught us how to paint on silk to enhance our Shabbat tables. Our Donor luncheon, "A Celebration of Music,” was a smash hit! More than 100 Sisterhood members clapped and sang along with the Congregation Bet Haverim choir. The closest thing the Jewish community has to a gospel choir, the CBH choir’s performance was inspirational and joyful and very entertaining. Big thanks go to Sherry Habif, who not only did her usual fantastic job with the room décor, but planned every part of the celebration. Every detail was perfect! Since our donor event is about the financial support for our synagogue community, we are proud to announce that we exceeded our fundraising goal! We are deeply grateful for Betty Behr’s remarkable leadership, which helped us raise $19,517 more than 15% above our goal! Your support always makes a difference. Z’havah members show off their artwork and newest piece of Judaica for their homes. sisterhood shabbat This year’s Sisterhood Shabbat, “From Our Mothers to Us,” was a true celebration of the women of AA Synagogue. We recognized our accomplished “Sisters” and the work we do together to support our community. Special thanks to Fran Galishoff for once again coordinating all the pieces of the Shabbat service and kiddush. Monday, July 9 & august 6 @ 10:15 am Join Sisterhood on the first Monday of the month for a lively book discussion. July’s book is We Were the Lucky Ones by Georgia Hunter, and the discussion will be led by Maury Gerson. August’s book is My Name is Asher Lev by Chaim Potok, and the discussion will be led by Ruth Kramarow. For more information, contact Madeleine Gimbel at 404.355.7711. You can now easily connect to Women’s League of Conservative Judaism anytime and anywhere, right on your smart phone or tablet! The Women’s League app makes access effortless. Do you need Shabbat candle lighting times? Just tap the app and you can quickly find them for any city in the world. Are you looking for some inspiration? Just tap the app and look in the Women’s League Calendar Diary for a new entry every month. Do you need to find information about a sisterhood? Just tap the app for a link to all Women’s League affiliated sisterhoods. Do you need programming ideas? Are you looking for membership documents? Do you need to order materials? Are you looking for conference information? Do you want to see photos from Women’s League events? Just tap the app and you’ll find it all! It’s easy: Just go to the App Store/Play Store, and search for WLCJ. Click on the Women’s League logo, install, and go! announcements the 100th year Starting in the fall, AA Sisterhood will begin planning for a year-long celebration of our centennial. We envision a year-long plan of activities that highlight the achievements of Sisterhood and recognize the contributions of the remarkable women in our community. If you are interested in joining the planning team and have ideas for the 100th year of AA Sisterhood, please let us know by contacting the Sisterhood presidents. It is a remarkable milestone for our Sisterhood and our entire congregation, a celebration of our history that sets the groundwork for our future. This is the 75th year that our Sisterhood has supported Conserative/Masorti movement through the Torah Fund Campaign. Contributions to the Torah Fund strengthen Jewish education by supporting scholarships and programming at Conservative/Masorti institutes of higher Jewish learning. Torah Fund donors receive the beautiful Mah Tovu pin that celebrates 100 years of the Women’s League. to begin to develop their interests, and they have built the stamina for this type of extended engagement with materials and processes. Most importantly, they have begun to foster the social and emotional skills needed to negotiate with peers and resolve conflicts productively. As for us, we will wish both our oldest students and Hannah well, and continue opening ourselves to growing opportunities. We stand tall as we say L’hitraot to old friends who mean the world to us. essence, humility, and sweet disposition. The popular story is based on Rebbe Zusha and his students who asked about why his teachings were so different from those of others. Rebbe Zusha took that comparison and explained that he is not worried about this since at the end of his life, when he appears before the Heavenly Tribunal, they will not ask why Zusha was not as pious as Abraham, learned as Moses, or brave as King David, rather they will simply ask, was he the best Zusha he could be. This story has ramifications for multiple parts of our lives. We constantly compare ourselves with others, sometimes to find that we are proud of ourselves and others to see that we are disappointed that we are not as successful as our peers. Rebbe Zusha pushes the notion that we need to exist without the burden of comparison to other people, because when we do this we ignore our own strengths and accomplishments and are unable to be the best versions of ourselves. Being Jewish is difficult, and it is especially difficult when we feel that we do not have the knowledge or experience to be the “right kind of Jew”. That type of thinking is irrelevant in the 21st century, since the image of the “right kind of Jew” has blurred into so many different things. Ultimately, it is up to us to set our own Jewish derech (path), instead of being dependent on our institutions to set our paths for us. The word derech (path) brings me back to my original thought, my first experience as a Madrich (counselor) at Camp Ramah Darom. In Hebrew, a Madrich means “one who makes a path”. Our work is not intended to dictate the lives we ‘want’ you to live, rather we hope our programs and learning experiences help create a path that you did not expect to find. Registration is now open! Registration for the 2018 - 2019 school year is now open! Kesher@AA is the religious education initiative for children ages three years old through 12th grade. Through our program, children will be inspired and curious about Judaism as they encounter a variety of topics through quality experiential education. Children who are a part of AA’s Sunday Jewish learning experience are placed into age-appropriate groups called eidot (Hebrew for groups). Each eidah is guided by a dynamic and experienced educator. Our eidot are: GAAn B’Ahava (ages 3-4), Kindergarden-1st grade, 2nd-3rd grade, 4th-5th grade, and 6th-7th grade. Each afternoon after Kesher ends, our students gather to develop their skills in Hebrew reading, decoding, and comprehension. Hebrew is the key to a rich Jewish life, and we are excited to watch this program flourish. 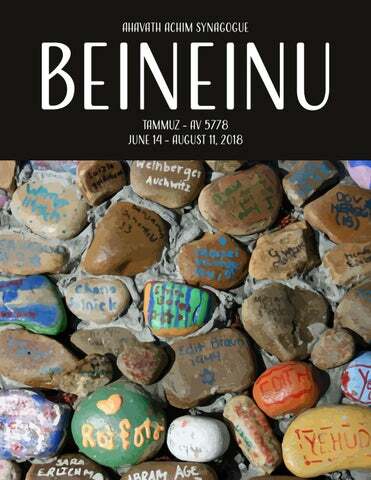 For a full schedule of Kesher@AA programs and events, please see page 15 or visit the AA website at aasynagogue.org/kesheraa. take our survey Attention families with children or teens ages 0 – 17: Home Beis@AA is working hard to develop programming for our new initiative. An important step in this process is gathering data from our community about how we can best serve you. Not only does this mean we offer relevant and interesting content that piques your and your family’s interests but that we offer them at times and places where families can attend. Please take a few minutes to complete our survey to help us best meet those criteria: bit.ly/ HomeBeisAA-Survey. Thank you for your support, and we look forward to seeing you at our amazing programs in the year to come! TAAglit Atzmi, meaning Personal Journey, is a triennial curriculum for students in 8th-10th grade. The curriculum is uniquely designed to impact day school students and public school students alike. The TAAglit Atzmi program provides an opportunity for teens to interact and build lifelong friendships with teens throughout the Metro-Atlanta area. These friendships are a building block to developing a stronger Jewish identity and connection to the greater Jewish community. This year, students will take an in-depth look into two of the most influential events in modern Jewish history, the Holocaust and the creation of the State of Israel. This class helps students place themselves in the multiple narratives and timelines which we inherit as American Jews, and create a deeper connection with their own personal narratives. AAtid, meaning Our Future, is a program for teens in 11th-12th grade. It runs on a two year rotation, each year with its own unique curriculum relating to the development and solidification of the participants’ Jewish identity. Each class will be based on primary sources from Biblical, Rabbinic, Medieval, and Contemporary texts. The goal for each student is to acknowledge their beliefs, and more importantly recognize where those beliefs originate. Our hope is that students will find insight in the Jewish wisdom that supplements each topic to help their own Jewish future. The program is designed in a way that allows participants to begin the program at any point within the two year rotation. Students have the option to sign up for the full year, and choose classes on a monthly basis. For a full schedule of TAAglit Atzmi and AAtid programs and events, please see page 15 or visit the AA website at aasynagogue.org/taaglit-atzmi or aasynagogue.org/aatid. Back to School BBQ august 12 - save the date! Join all your AA friends and family as we kick off the start of a new school year with delicious food, fun, and celebration as we start the new year the right way! We are so excited to reinvigorate our beloved Chai youth community! We have planned out an exciting year for three youth groups, Machar (3rd-5th Grade), Kadima (6th-8th Grade), and USY (9th-12th Grade). For many Jewish children, Jewish youth group is where lifelong relationships begin. Chai Youth has connected our children for decades, and we are excited to relaunch this effort with all of you. Zoe Glickman Chai USY President Zoe is an incoming sophomore at North Atlanta High School. She has been a part of Chai USY for about three years, two years in Kadima and one year in USY. This year Zoe hopes to grow the Chai USY chapter, and create a space where everyone is welcome. USY has been a big part of her life for three years now and she wants everyone her age to get the same opportunities that she has had. Lily Citron Chai USY Vice President Lily is an incoming sophomore at Saint Francis High School. She has been a part of Chai USY for four years. Lily hopes to make Chai USY more known around the Atlanta area, and make our chapter bigger! Matthew Aftergut Kadima Membership and Communications Matthew is an upcoming sophomore at Union Grove High School. He has been involved in Chai USY for almost 4 years. This year Matthew hopes to expand our program and reach out to more middle schoolers and upcoming high schoolers to join our program. He plans to get to know everyone who is in our program as well as the people who may want to join. Nora Rosenfeld Chai USY Programming Vice President Nora is an incoming sophomore North Atlanta High School. She has been involved in Chai USY for four years. Nora hopes to get some great programs started within our USY chapter that are both fun and impactful on our society. She also hopes to attract new members with creative programming to help build up our amazing chapter! March 15 - 17, 2019: Regional Gesher Convention for 8th graders April 12 - 14, 2019: HaNegev Regional Convention For a full schedule of Chai Youth programs, events, and meetings, please see the next page or visit the AA website at aasynagogue.org/ come-together. The Jewish Federation of Greater Atlanta annually presents “The Marilyn Shubin Professional Staff Development Award” to an outstanding Jewish communal professional. The recipient must be from one of the agencies within the Federation system, and must have served in the field of Jewish communal service for at least three years and no more than ten years. The Award winner will receive a stipend to be used for the advancement of professional studies, and will be recognized at the Jewish Federation of Greater Atlanta’s annual meeting. The nominating agency of the winner will also receive a stipend to be used for agency-wide professional development. This year's winner of the award is AA member, Jeremy Katz. What is the leadership role/committee you serve on? I serve on the board of the Southern Jewish Historical Society and the Society for Georgia Archivists. What would you like people to know about being involved in synagogue leadership/ on a synagogue committee? Since arriving five years ago, I have worked hard to make a lasting impact on the preservation of Southern Jewish history and Atlanta’s Jewish community. After completing a Master’s degree in Archival Science and training with the American Jewish Archives, the Columbus Jewish Historical Society, and the Jewish Federation of Greater Dayton, I came to Atlanta to assume an archivist position at the Cuba Family Archives for Southern Jewish History at the Breman. Within a year, my mastery of the collection and outstanding knowledge of best practices for history preservation elevated me to the position of Archives Director, where I have since been charged with managing archives staff and making key decisions regarding the collection. During my tenure, the collection has grown to become the largest repository of archival materials related to Southern Jewish history, and research requests have gone up over 500%. Do you have any specific memories or experiences that encouraged your participation in the community? I've served as a Moishe House resident and Birthright leader, developing meaningful Jewish experiences for young professionals. While a resident in Moishe House from 2016-2017, I helped create 152 programs reaching over 2,200 community members. In 2017, I was honored as one of Jewish Atlanta's 40 Under 40 by the Atlanta Jewish Times. What does winning the Marilyn Shubin Professional Development Grant Award mean to you? Winning this award allows me the opportunity to take continuing education classes on the topic of digital archives that I would not be otherwise able to attend. The museum has very limited professional development funds available to staff so receiving this award is just another example of how supportive the Jewish community has been throughout my career. •	Every day brings advances in life-saving techniques – many of which require blood or blood products. •	Blood products cannot be stored indefinitely. Because blood may be needed at any time, it must be collected regularly. •	No one expects to need blood. However, if it is not available when the need arises, the consequences can be fatal. •	Those who donate can tell you there is no better feeling than saving a life. •	Only about 5% of those eligible to donate actually donate blood. That is why regular donors, those who donate 3 to 4 times per year are so important. •	It is time to bring in new, first time donors. Is that YOU? If you have never donated blood, think about the importance of donating blood. Thank you and congratulations to everyone who participated in the May 6 Blood Drive. We collected 77 pints of blood! A special thanks goes out to everyone who volunteered time to make the Blood Drive a success: Amy Arnold (Congregation Or Ve Shalom), Sam Benator (Congregation Or Ve Shalom and JWV), Susan Caller (AA), Helen Scherrer Diamond (AA), Bebe Kaplan (AA), Robert Max (JWV), and Dave Norflus (AA); AA facilities staff: Chris Carr, Wesley Coney, and Deionta Huff; and AA members who either donated or tried to donate blood (You are our heroes): David Adelman, Joe Citron, Avital Cohen, Harold Cohen, Douglas Diamond, Andy Edlin, Lonnie Edlin, Alexandra Eichenblatt, Ken Feinberg, Diana Fiedotin, Jordan Forman, Melinda Gertz, Scott Glazer, Philip Goldstein, Lynne Greenfield, Michael Greenfield, Tom Greenfield, Fred Halperin, Mary Pat Hill, Glenna Hornstein, Steven Jacobs, Darryl Konter, Roslyn Konter, Lori Krinsky, Rita LeVine, Linda Lippitt, Donna Newman, Philip Newman, Mark Papier, Joel Rosenfeld, Laurence Rosenthal, Rosalie Rosenthal, Neil Sandler, Susan Sandler Richard Siegel, Gail Solomon, Craig Strickman-Levitas AA's next Blood Drive will be on August 5, from 9:00 am - 2:00 pm. Walk-ins are welcome, but appointments are preferred. To schedule an appointment, go to www. redcrossblood.org, and enter code JWV. For more information or questions about reserving an appointment, contact Gail Solomon at 404.351.1900 or gailsol@gmail. com. 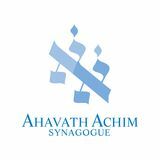 Blood Drive Co-Sponsors: Ahavath Achim Synagogue, Congregation Shearith Israel, Congregation Or Ve Shalom, Jewish War Veterans Post 112, and Fulton Lodge No. 216 F. & A.M.
Join the rabbis and fellow congregants every Tuesday for an educational experience about current events and the Bible. Join Rabbi Laurence Rosenthal in the Koplin/Borochoff Library every Wednesday as we dive into the minds of our rabbis and rabbinic tradition. Explore the Talmud, the central text of our Jewish life, and learn its basic structure and amazing and spiritual impact. No previous knowledge of the Talmud is necessary. For more information, contact Rabbi Laurence Rosenthal at lrosenthal@aasynagogue. org. Join Rabbi Sandler every Thursday morning for a study group following Morning minyan. For more information, contact Rabbi Neil Sandler at nsandler@ aasynagogue.org or 404.603.5740. Come join Mr. Michael and PJ Library one Saturday each month for stories and interactive songs celebrating Shabbat and upcoming Jewish holidays. Enjoy stories and songs followed by snacks, playtime, and Kiddush lunch. Everything is free and geared towards families with children ages 0-4. Join Sisterhood on the first Monday of the month for a lively book discussion. July’s book is We Were the Lucky Ones by Georgia Hunter, and the discussion will be led by Maury Gerson. August’s book is My Name is Asher Lev by Chaim Potok, and the discussion will be led by Ruth Kramarow. For more information, contact Madeleine Gimbel at 404.355.7711. For more information, contact Madeleine Gimbel at 404.355.7711 or visit the AA events calendar at aasynagogue.org/events. Join the rabbis every second Wednesday of the month at the Piedmont at Buckhead (650 Phipps Blvd NE, Atlanta 30326). Please join us for Torah Study session every Saturday morning. For a list of facilitators, visit aasynagogue.org/ learning/adult. Join the Rabbis for lunch and learning at the offices of Birnbrey, Minsk, Minsk, and Perling (1801 Peachtree St NW #300, Atlanta 30309). To RSVP and pre-order lunch, contact Jill Rosner at jrosner@ aasynagogue.org or 404.603.5741. Please join Sisterhood women every Sunday to play, schmooze, have fun, and connect with other women. We are patient, willing to teach, and will welcome you. For more information, contact Nancy Canter Weiner at ncweiner@mindspring. com. The renowned Jewish philosopher, Martin Buber, used to call prayer a “dialogue” between man and God. Buber's philosophy is at the core of our new family Shabbat morning program; you and your child(ren) will engage in a dialogue with God through niggunim (wordless melodies), meditation, discussion, celebration, and, of course, laughter. Give the gift of life by donating blood. To schedule an appointment, go to www.redcrossblood.org and enter sponsor code JWV – you will be taken directly to the Ahavath Achim Blood Drive where you can schedule your appointment. For more information, contact Gail Solomon at gailsol@gmail. com or 404.351.1900.
say "Shabbat Shalom" then you are a fully trained greeter. Greeters welcome everyone with a smile. They stay in the foyer in front of Ellman Chapel for approximately one hour on Shabbat. To join the greeter team, contact Mildred or Marty Kwatinetz at zaydekw@comcast.net or 404.812.1734.
grade! Sports, swimming, arts and crafts, Membership Committee Volunteer Opportunity: The membership committee science, drama, field trips, dance, is looking for friendly members who want to make welcome phone calls to new members, invite new members to Shabbat dinner, or help bake and deliver challot to new members. If you'd like to help, please contact Sharon Zinns at sharonzinns@ gmail.com or Mark Papier at papier. mark@gmail.com. community service, music, and Israeli cooking - your camper will do it all while making lifelong Jewish friends and connecting with positive Jewish role model counselors. Registration and more info: inthecitycamp.org. features a different congregant, a cause that is meaningful to him/her, and the organization he or she is involved in to support the cause. If you would like to expose "your" cause and teach others how they can get involved, please reach out to Director of Marketing, Anne Cohen, at acohen@aasynagogue.org. (or expertise) you’d like to share? For example, do you have a background in Public Relations, Writing, Event Planning and/or Coordination, Volunteerism, Fundraising, Teaching, Customer Service, Research, Education, Sales, etc.? We’d love to know about it! Please email Miriam Habif, Membership and Event Coordinator, at mhabif@aasynagogue.org with information about the skill-set you can bring to the table. This is the 75th year that our Sisterhood has supported Conserative/ Masorti movement through the Torah Fund Campaign. Contributions to the Torah Fund strengthen Jewish education by supporting scholarships and programming at Conservative/Masorti institutes of higher Jewish learning. Torah Fund donors receive the beautiful Mah Tovu pin that celebrates 100 years of the Women’s League. Need Loans for Higher Education? Jewish? You may be eligible for an interest-free, need-based loan for your limmudfest - August 31 - september 3 "last dollars" to attend school for your The LimmudFest team is made up of higher education. Application dates: volunteers who work year-round to create September 1 - 30. More info: jelf.org. a meaningful weekend of Jewish learning. LimmudFest, returning to Ramah Darom on Labor Day Weekend, is a community that creates space to craft unique Jewish experiences. Examine your connection to Jewish ideas and tradition. Meet people who share your curiosity and enthusiasm. Tackle thoughts with a diverse group of people. Registration and more info: limmudse.org. The non-profit Jewish Interest Free Loan of Atlanta offers assistance to community members in overcoming financial challenges. An interest-free loan from JIFLA can be the deciding factor in many situations - whether an upcoming life cycle event, new eye glasses, car repair, a psych-eval test or a summer camp experience. To date, JIFLA has awarded over $430,000 in interest-free loans to 100+ Atlanta families. More info: jifla.org.